Blowing Your Whistle on Injury Images of people participating in various activities will be shown. These pictures will display people NOT managing their. 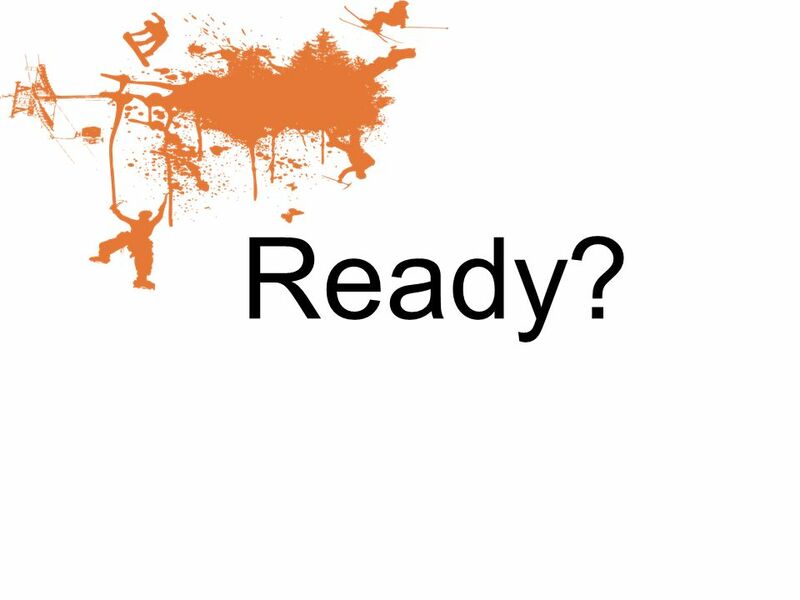 3 Images of people participating in various activities will be shown. 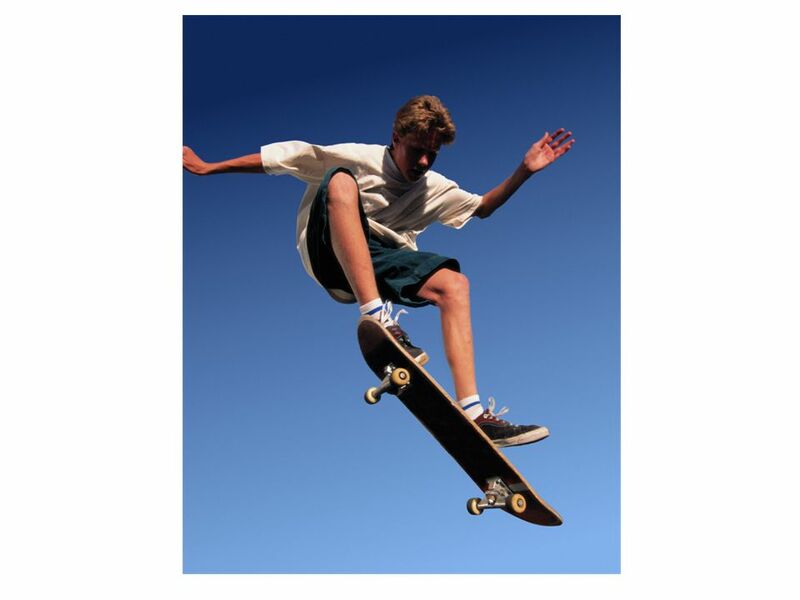 These pictures will display people NOT managing their risk appropriately: They will be doing or NOT doing one or more things that can lead to potential injury. 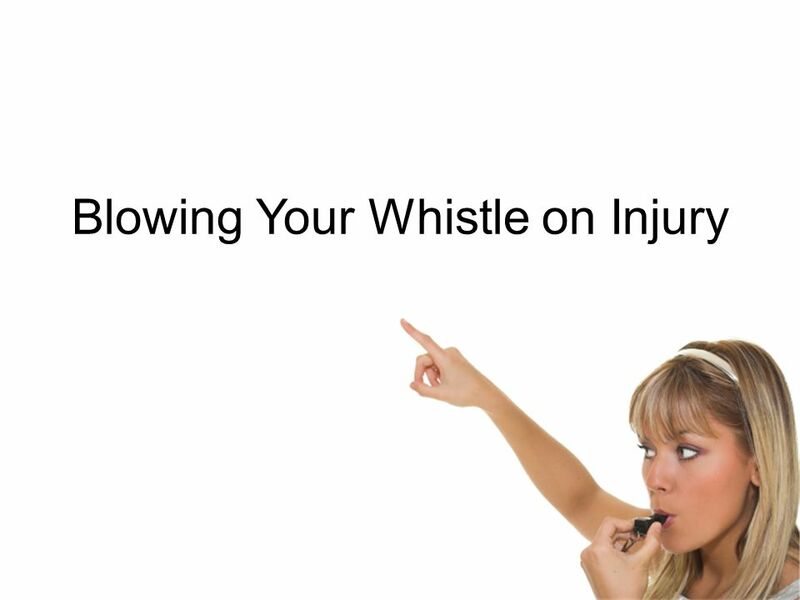 It is up to YOU to blow your whistle on injury. 4 When you spot the risk, blow your whistle. 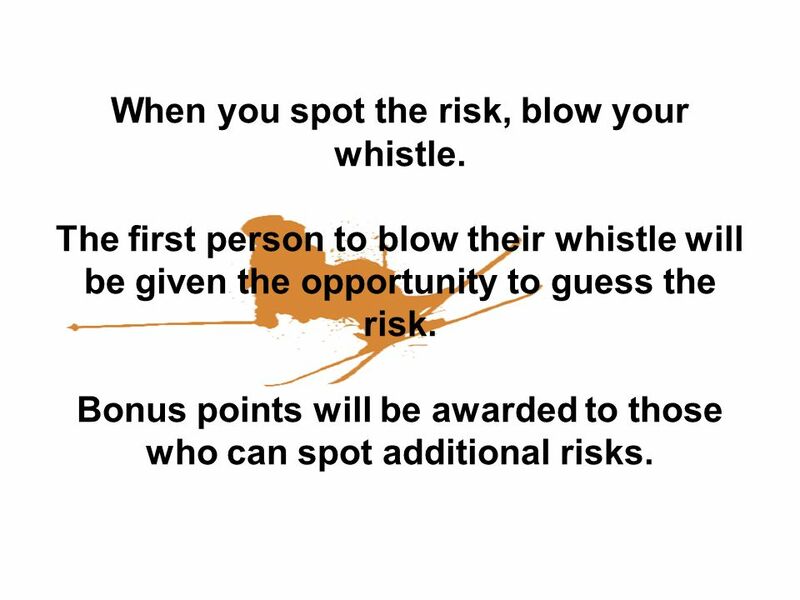 The first person to blow their whistle will be given the opportunity to guess the risk. 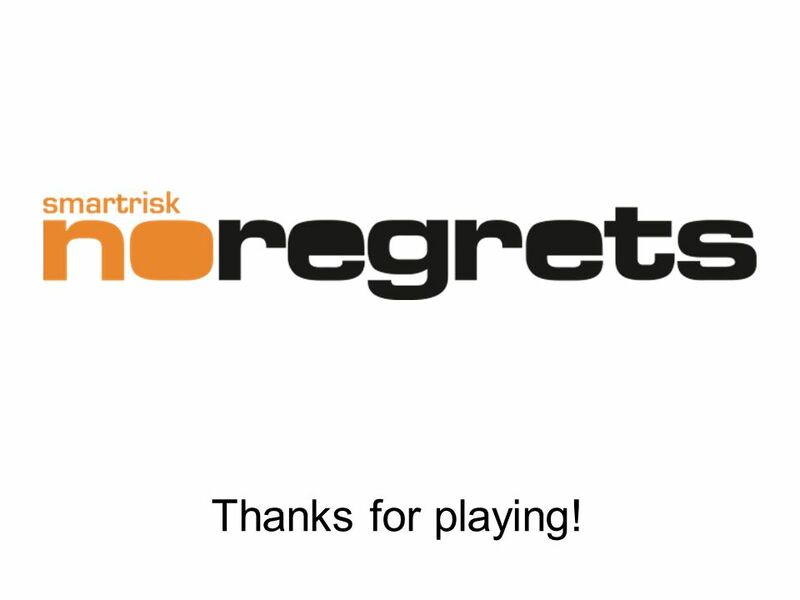 Bonus points will be awarded to those who can spot additional risks. 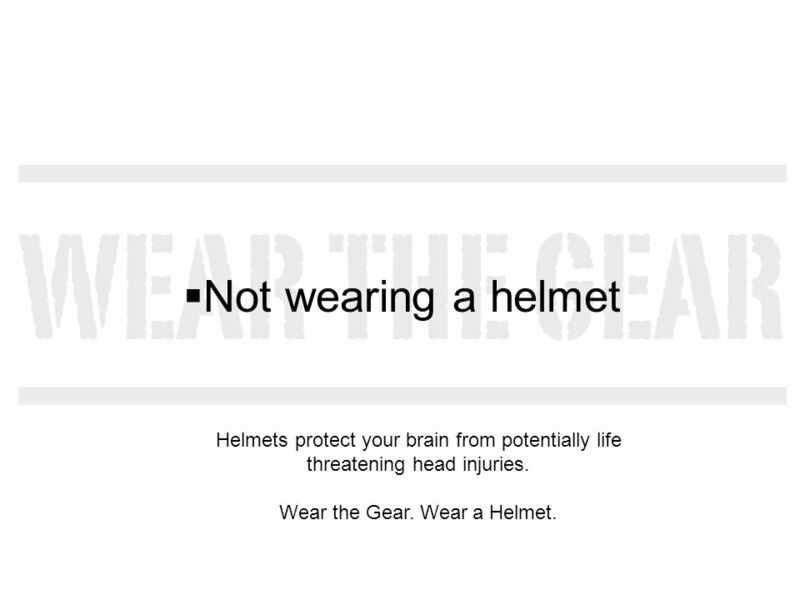 7 Not wearing a helmet Helmets protect your brain from potentially life threatening head injuries. Wear the Gear. Wear a Helmet. 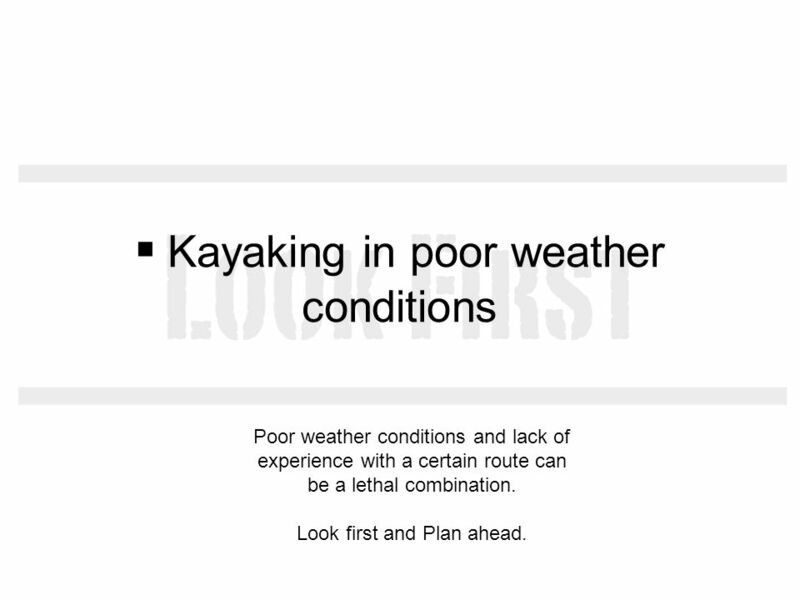 9 Kayaking in poor weather conditions Poor weather conditions and lack of experience with a certain route can be a lethal combination. Look first and Plan ahead. 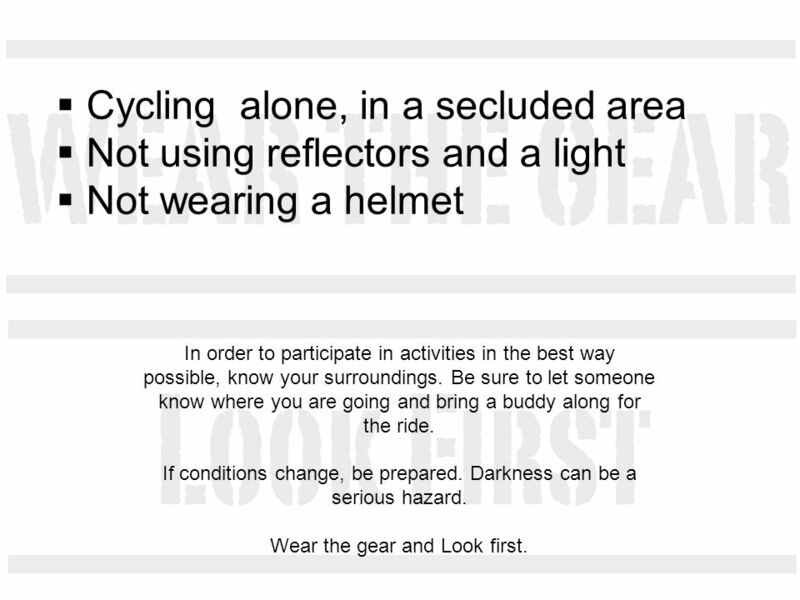 11 Cycling alone, in a secluded area Not using reflectors and a light Not wearing a helmet In order to participate in activities in the best way possible, know your surroundings. Be sure to let someone know where you are going and bring a buddy along for the ride. If conditions change, be prepared. Darkness can be a serious hazard. Wear the gear and Look first. 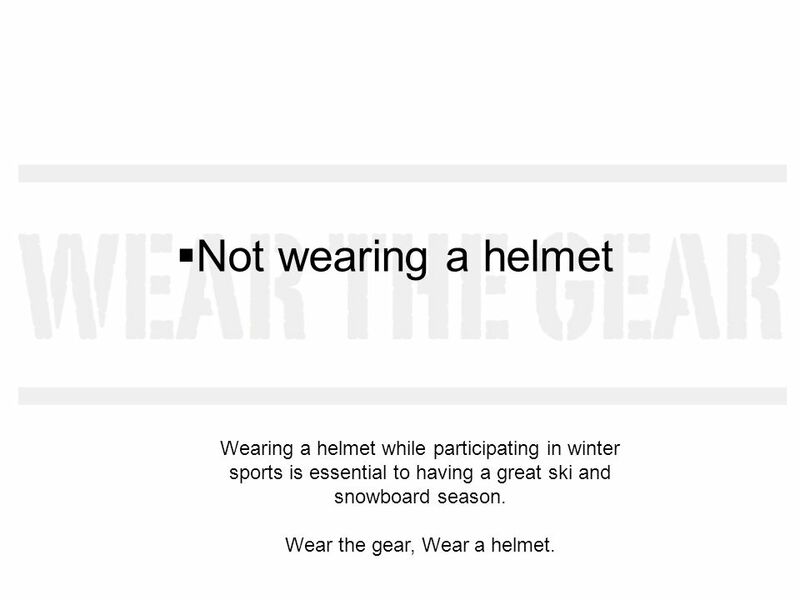 13 Not wearing a helmet Wearing a helmet while participating in winter sports is essential to having a great ski and snowboard season. 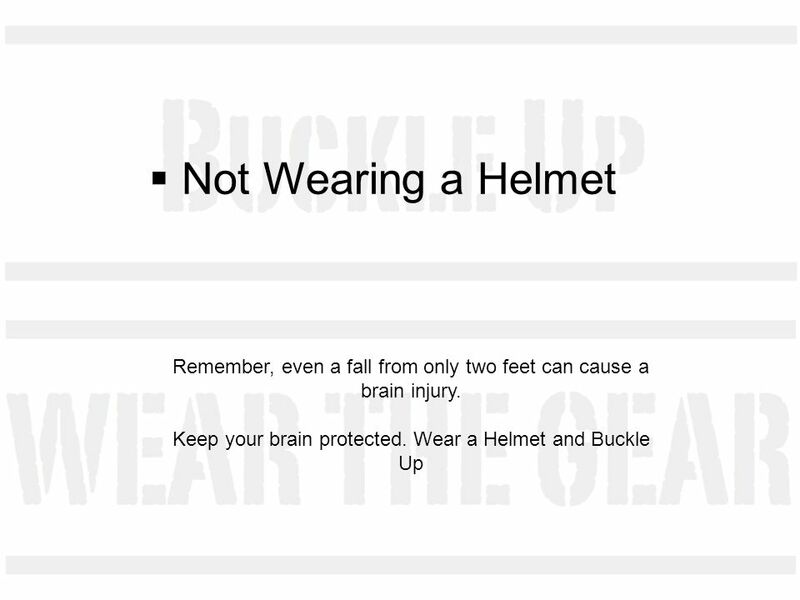 Wear the gear, Wear a helmet. 15 Untrained Being too young, inexperienced or untrained is a common way to get seriously hurt. 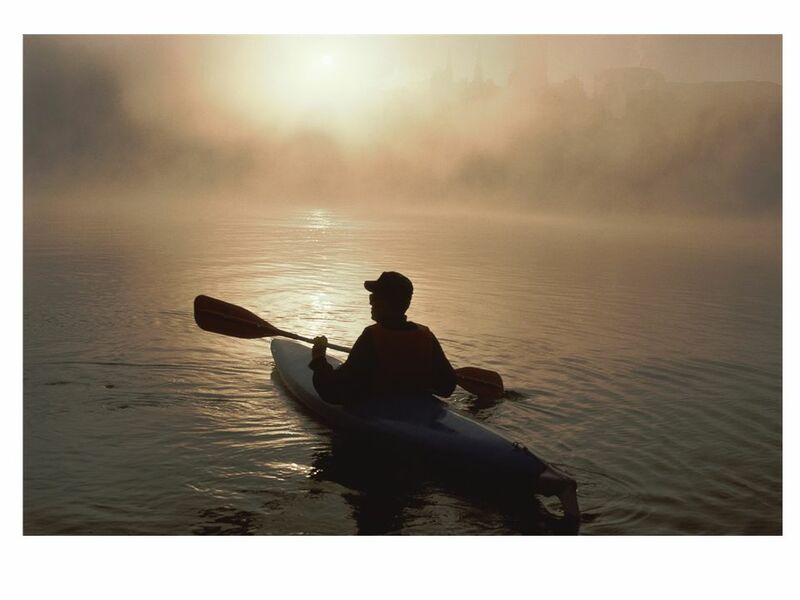 Dont allow your skill level to interfere with enjoying life. 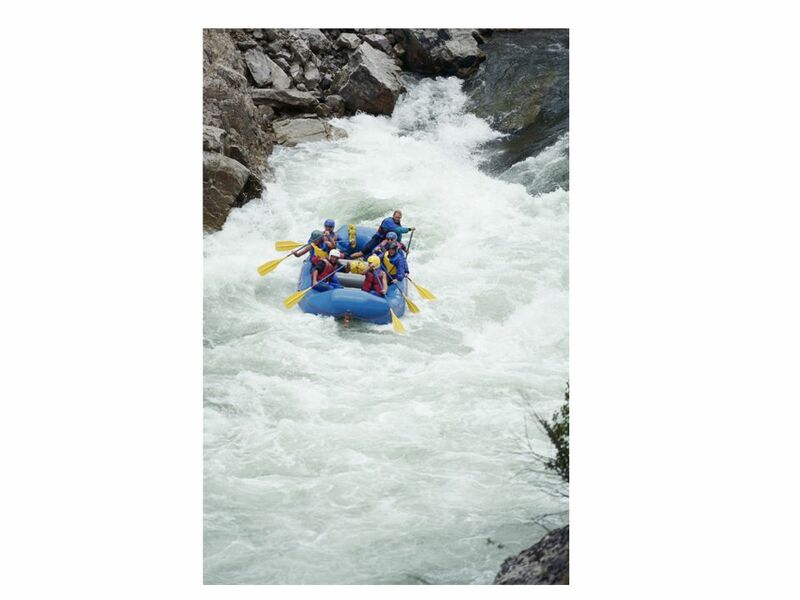 Get trained and try something new. 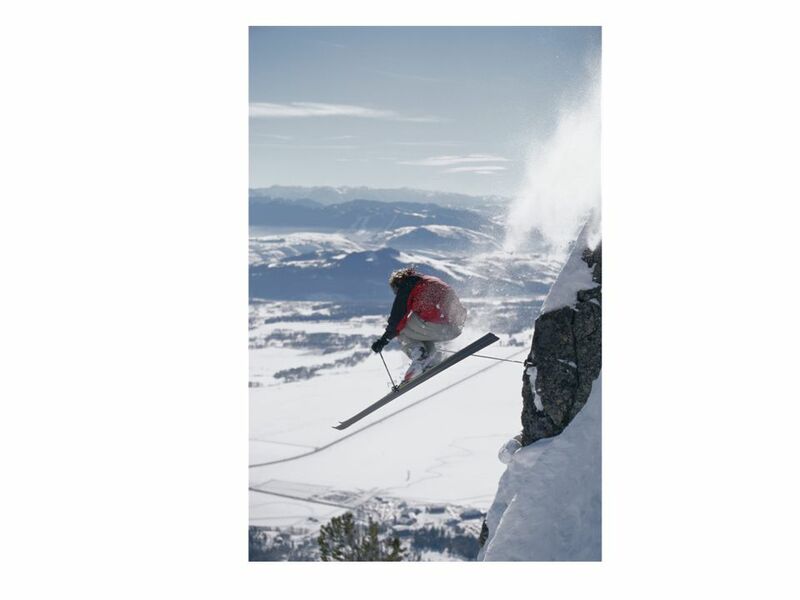 17 Unplanned off-trail skiing Not wearing a helmet A well planned and thought out, off- trail ski or snowboard trip can be invigorating and tons of fun. 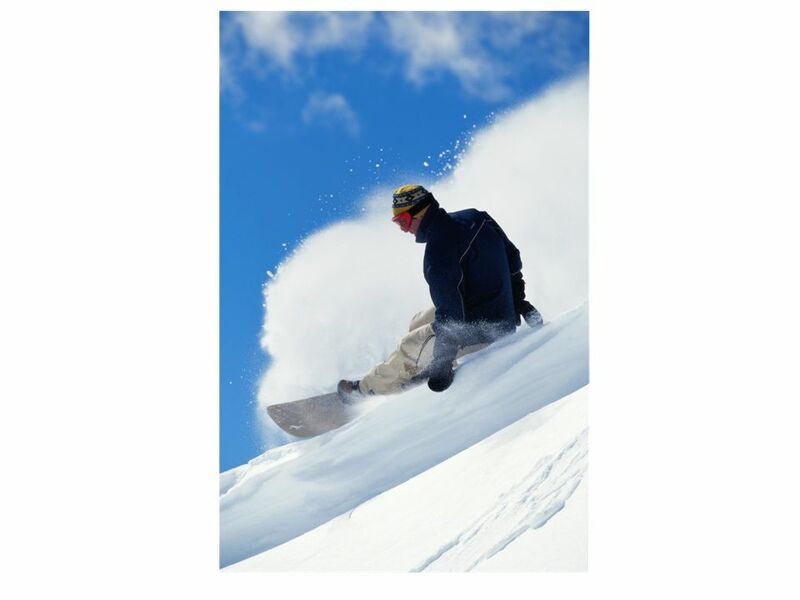 If you plan on going off trail be aware of the avalanche conditions, bring the appropriate gear and go with other skiers. 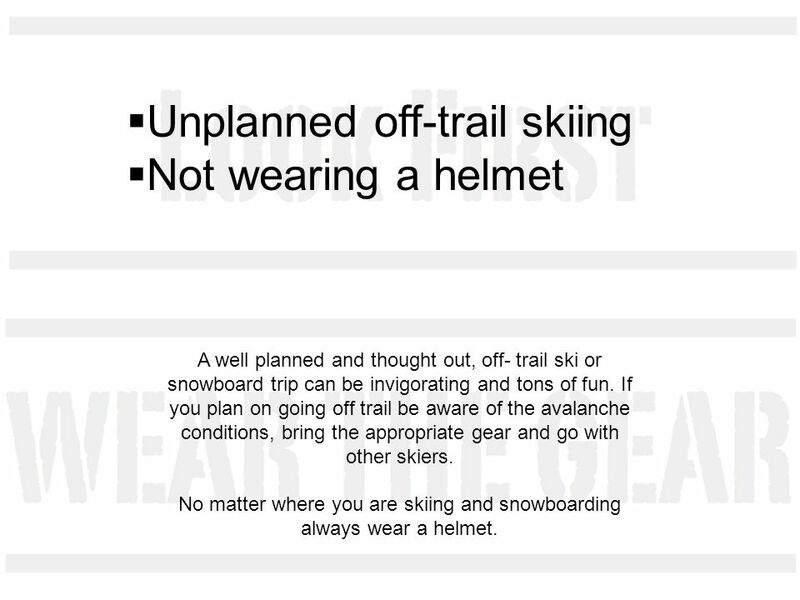 No matter where you are skiing and snowboarding always wear a helmet. 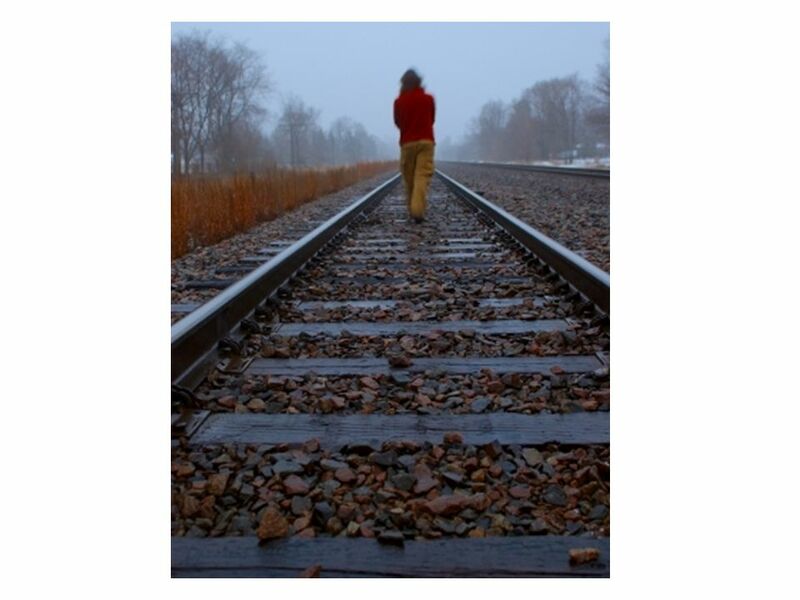 21 Walking on train tracks Walking on or near train tracks is never a good idea. 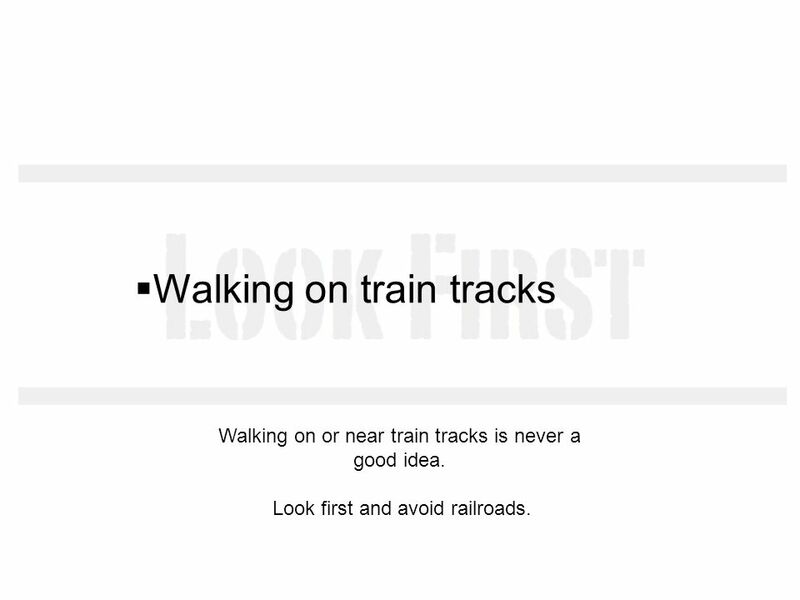 Look first and avoid railroads. 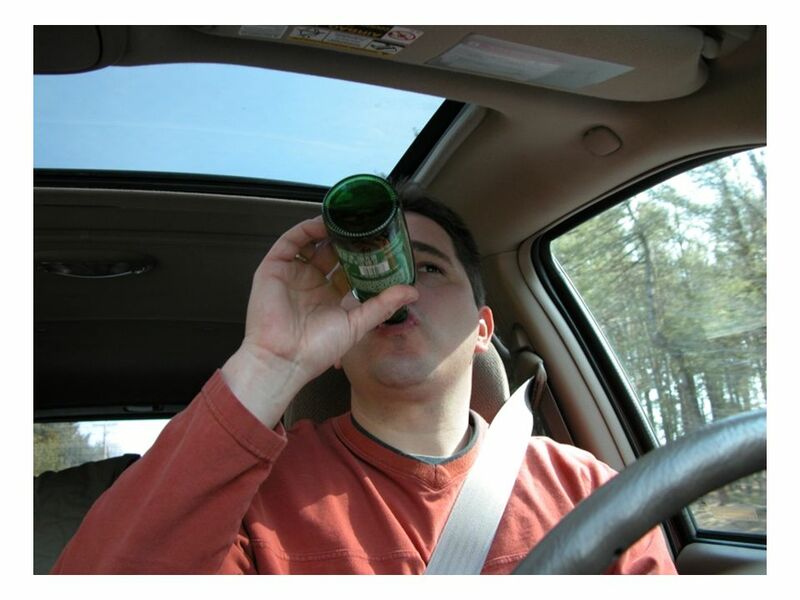 23 Drinking and driving Nearly one out of three drunk drivers involved in fatal crashes are between the ages of 16 and 24. Stay focused. 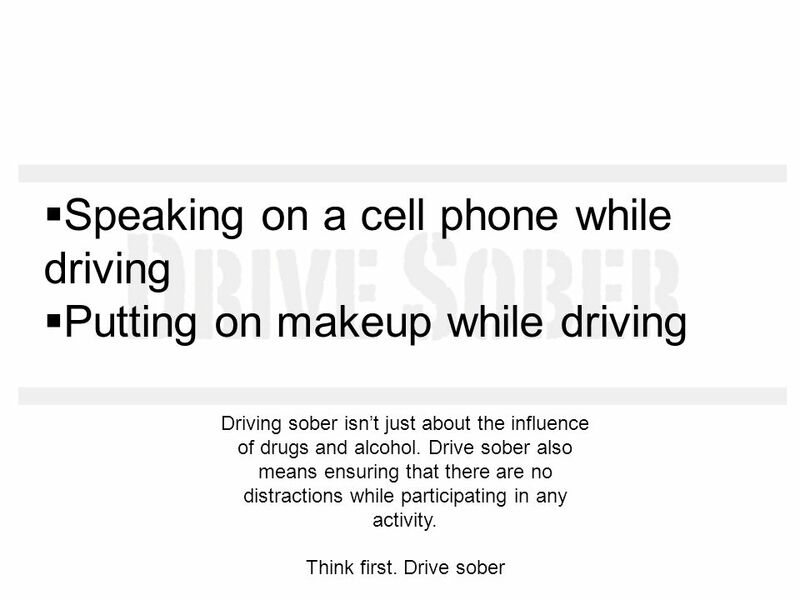 Drive sober. 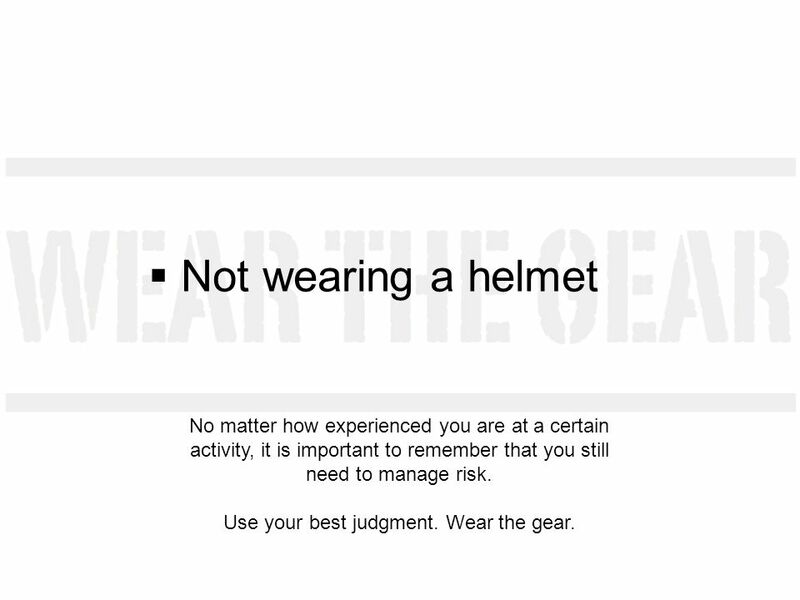 27 Not wearing a helmet No matter how experienced you are at a certain activity, it is important to remember that you still need to manage risk. Use your best judgment. Wear the gear. 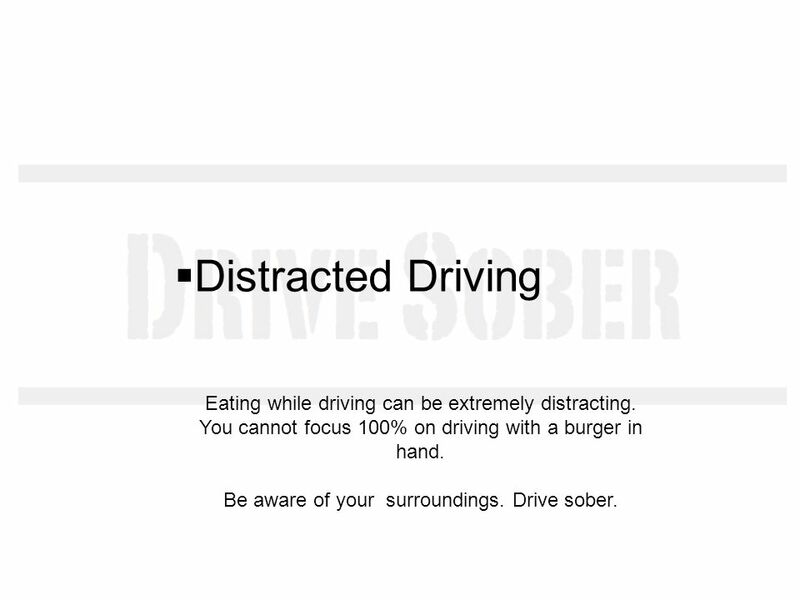 29 Distracted Driving Eating while driving can be extremely distracting. 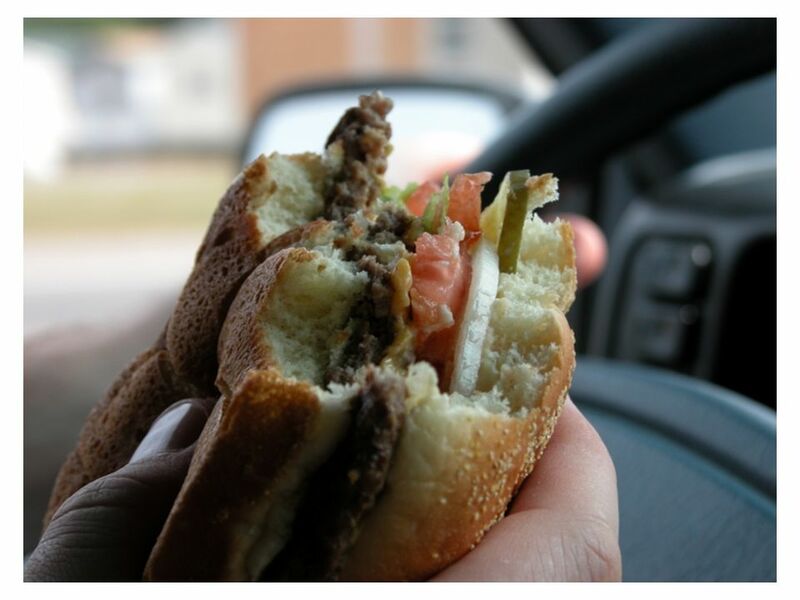 You cannot focus 100% on driving with a burger in hand. Be aware of your surroundings. 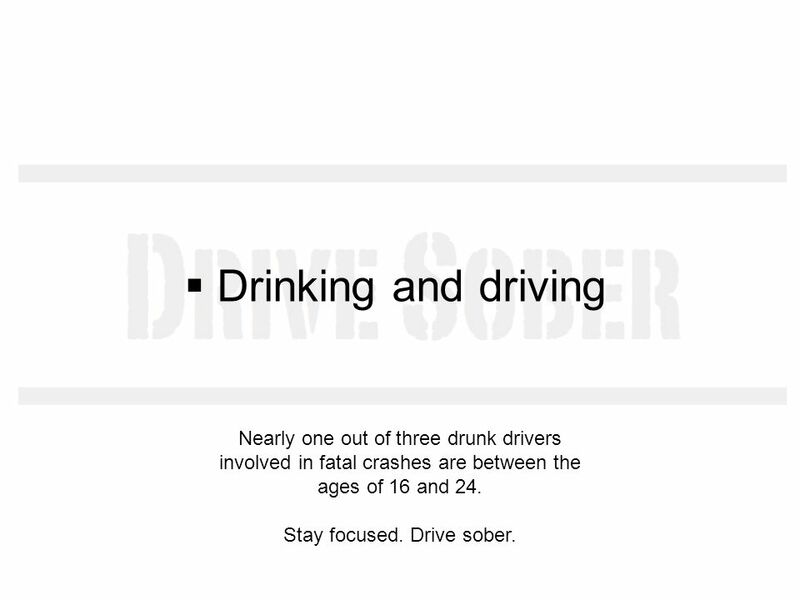 Drive sober. 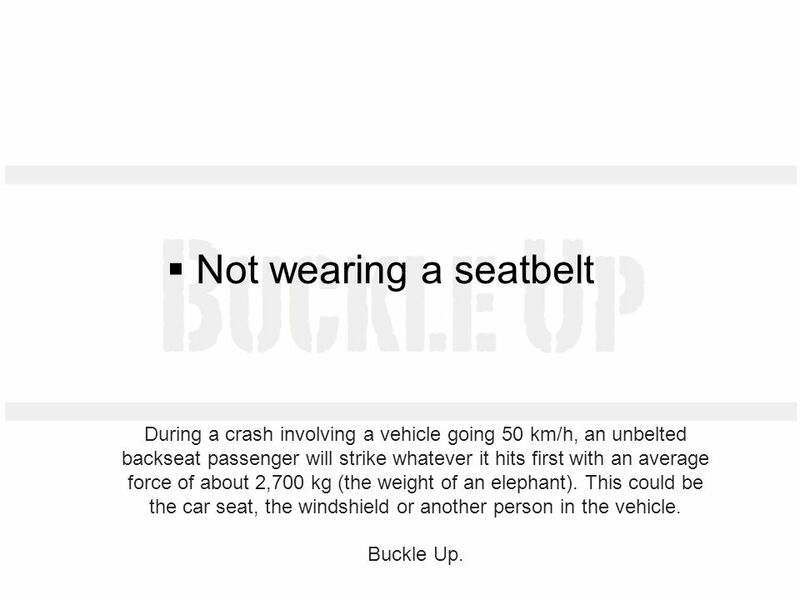 31 Not wearing a seatbelt During a crash involving a vehicle going 50 km/h, an unbelted backseat passenger will strike whatever it hits first with an average force of about 2,700 kg (the weight of an elephant). This could be the car seat, the windshield or another person in the vehicle. Buckle Up. 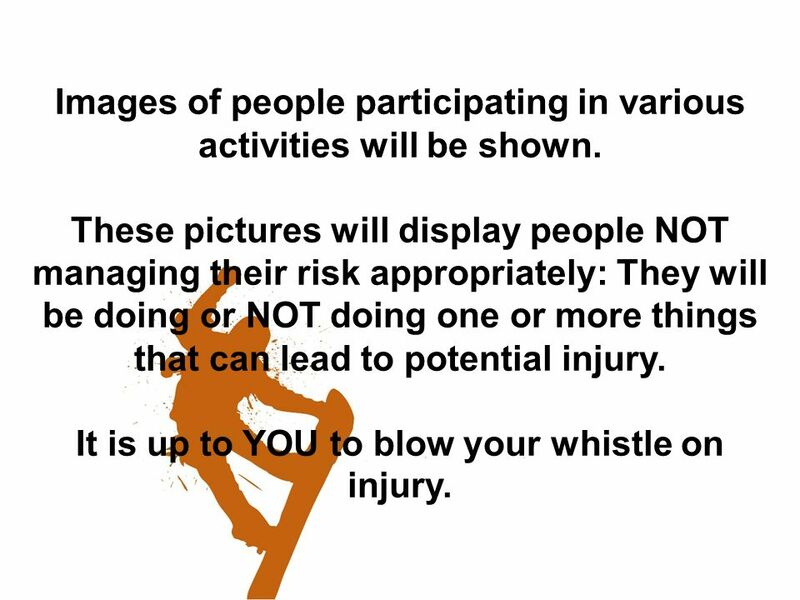 Download ppt "Blowing Your Whistle on Injury Images of people participating in various activities will be shown. These pictures will display people NOT managing their." 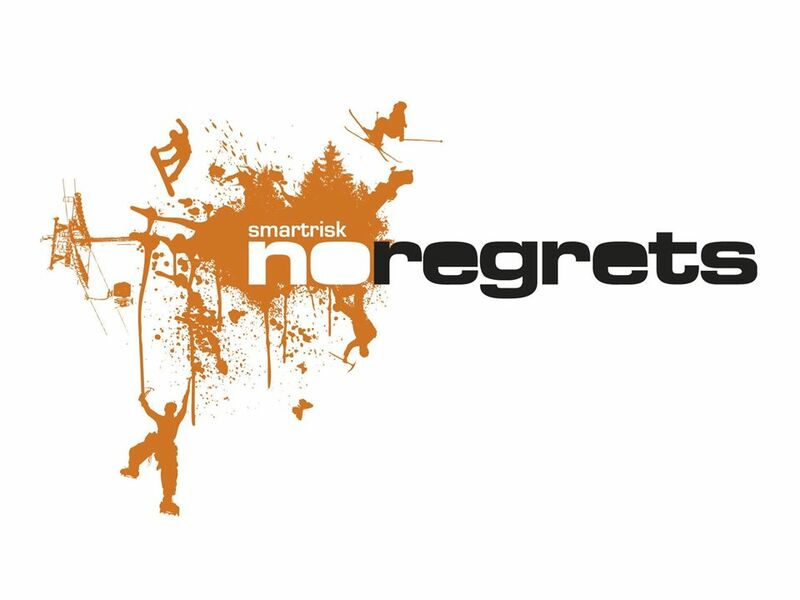 November 2004Year 7 Risks on the Road Introduction Far too many teenagers get killed/injured on our roads WHY? SAFETY: Safety on the Road Ms. Mai Lawndale High School. Motorcycles Bicyclists Buses Funeral Processions Pedestrians Trucks & others. 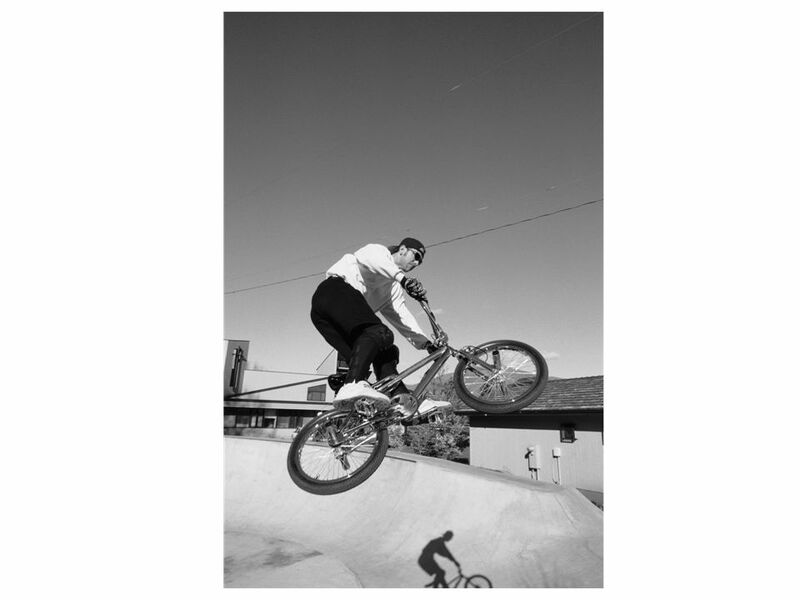 BELL WORK Have you ever had an accident while camping or riding a bike or skateboard? If so explain. Car Passenger Safety Years 10 & 11. THE FACTS: number of people involved in road crashes every day in the UK in 2012: Many of those killed and. May 2005Seatbelt Workshop Noel Gibbons Road Safety officer. B4 U Drive. We’re Not Kids Anymore  We’re not kids anymore, so people expect more of us – even when it comes to riding in a car.  The challenge is knowing. 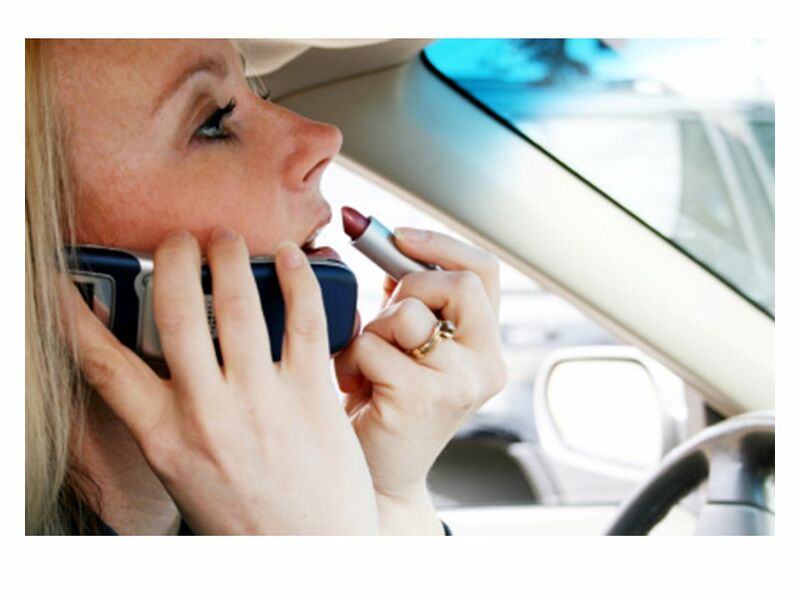 Distracted Driving Facts What Is Distracted Driving? 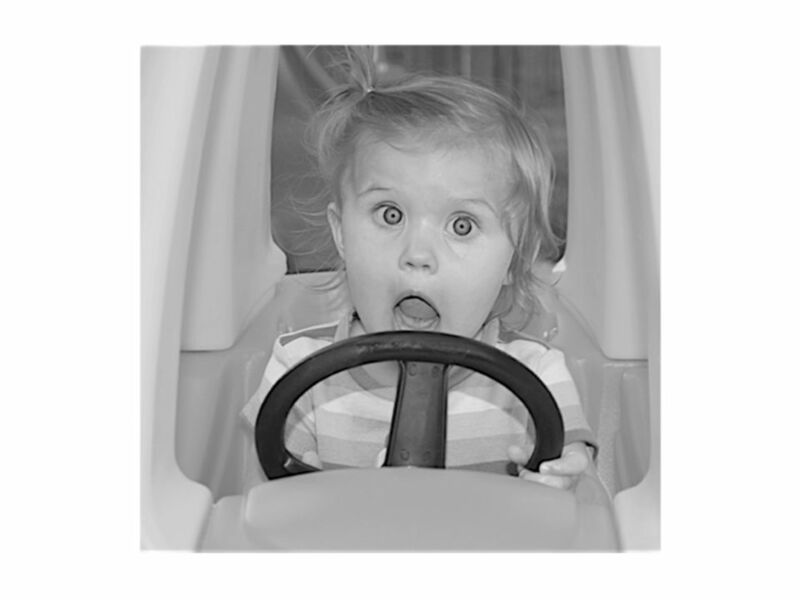 There are three main types of distraction: Visual — taking your eyes off the road Manual — taking. STOPPING THE #1 KILLER OF TEENS IN AMERICA. TOO MANY TEENS ARE DYING Motor vehicle crashes are the #1 killer of teens in America About 400 junior high. Bicycle Safety Presented by: The Jefferson County Sheriff’s Department. Road Safety Awareness – Year 11 Road Safety Education Officer Service - Governance, Promotion and Road Safety Education Branch 2020 VISION: DRIVING ROAD. CYCLE SAFETY. 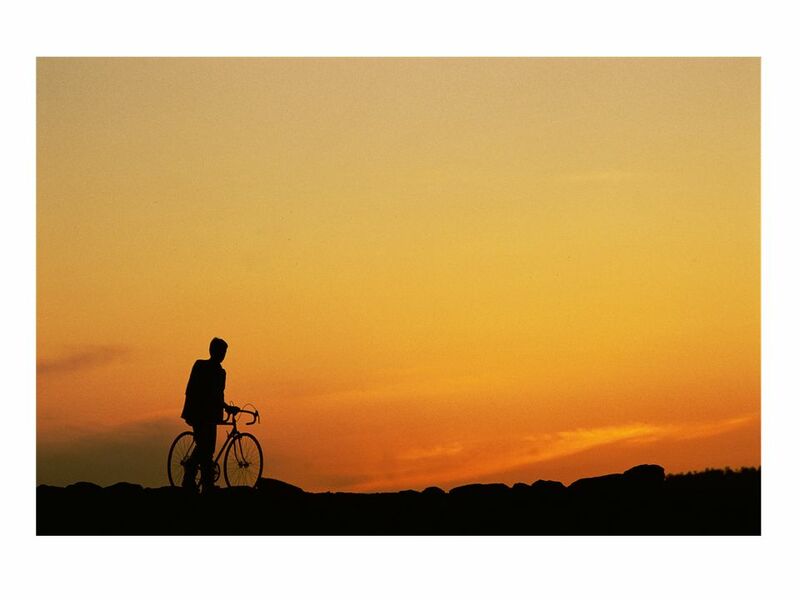 Cycle Safety Learning Objective: –Children to understand what constitutes appropriate behaviour for cyclists and how to be as safe as possible. Self-Defense Healthy Living, Q: What does self-defense mean to you? A: Self-defense means doing everything possible to avoid fighting someone who. Transportation Tuesday TRANSPORTATION TUESDAY SAVE YOUR CHILD’S LIFE TODAY TEACH THEM HOW TO BE A SAFE PEDESTRIAN TAKE A WALK ON THE SAFE SIDE.